Question: We need to become imbued with desire from the group, but also to take desire from the masses. What is the difference? 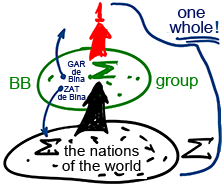 Answer: There is our group, Bnei Baruch (BB), and there are the nations of the world. Even if a unity (∑) of the nations will arise in the future, it will only be able to beget a cry aimed upward. Their unity is good for joining into our unity. And our unity, in turn, will join with the One (1). Thus, there is unification of the nations, there is unification among us, and there is unification of the nations with us, where masses become included in us like the seven lower Sefirot of Bina. It is necessary to have internal unity below and internal unity above, and then we all unite and merge with the Creator into a single whole. In this manner, we, as the three upper Sefirot of Bina (GAR de Bina), should provide the correction of its seven lower Sefirot (ZAT de Bina). Question: So there are two levels of correction: We unite for the sake of bestowal, while the masses need to correct egoism on the material level? Answer: We don’t correct anything there among the nations. We connect to people and take their desire, which helps us band together even tighter and to establish a connection with the upper force, with the Light. And the Light acts on them through us. Ultimately, we are the ones who are performing the work, and not the masses. Without being capable of doing it themselves, they give us the strength for correction, and no more than that. It’s true that they also need to try to unite; however, nobody is capable of real unity, not even us. Only the Light realizes it. And this is why the most important thing is for them to understand that without unity between them, there won’t be a good life. And we will take this demand, we’ll penetrate and absorb the depth of its bitter grief and transform it into a prayer.